Preparing and staining a wooden garage door is a fairly simple process, so it should not present any problems to any DIY enthusiast, so long as the following instructions are adhered to. Sticking to a few straightforward steps will guarantee a great-looking door that will remain protected from wear and tear and the elements! Avoid a power washer as these can damage a wooden surface. Just use a sponge and elbow grease for the best results. 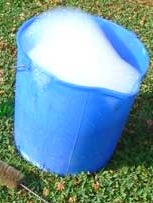 Rinse with a garden hose and leave to dry for at least three hours. If the door is automatic, you will need to disengage the mechanism so that you can open and close it manually. This will make the job easier. Protect the edges with masking tape. Next you need to sand the door with a medium-fine sandpaper sponge or block – always sand with the grain so you don’t damage the wood! Now to apply the stain. First clean the door with a dry lint-free cloth. 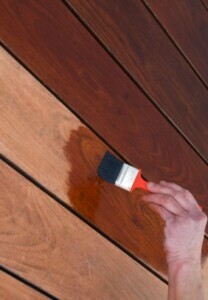 Then begin to paint the stain on evenly, using a brush. Try not to have too much stain on the brush and you will avoid drips and brush marks. Go for applying a consistent quantity of stain with each new dip into the tin. Alternatively you can use a roller or sprayer, but only for oil-based stains. It should be unnecessary to apply more than one coat. There are many suitable products on the market offering different colours. Some enhance the grain of the wood, others obscure it to some degree, and it is purely a question of personal taste which one you choose. Μost of these contain pigment and dye in various ratios, and the length of time they are left on the wood dictates the depth of colouration. Pigments are opaque and will not strongly colour dense woods, but open-pored woods such as pine will be highly coloured. Dyes are translucent. Gel-based stains have little penetrability, being closer to paint than to oil-based stains. 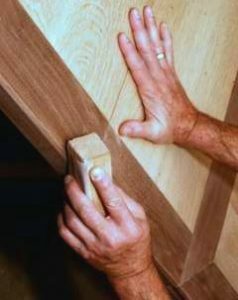 The stain should take about fifteen minutes to penetrate the wood to its maximum density. After thirty minutes take a dry brush and clean off any excess stain that has not soaked into the wood. It is optional to apply a polyurethane coat over the stain if you want a gloss finish on your door. This will require either one or two applications, depending on the product. Bear in mind that, unlike the untreated oil stain, the polyurethane layer will begin to peel over time. If you wish to refinish the door, you will have to strip the wood down before doing so.